Shimmer and sparkle with these classic 4mm round stud earrings. Crafted from luxurious and contemporary 9ct rose gold for a feminine look, these pretty stud earrings are set with a shimmering round cubic zirconia in each stud for sophisticated sparkle. 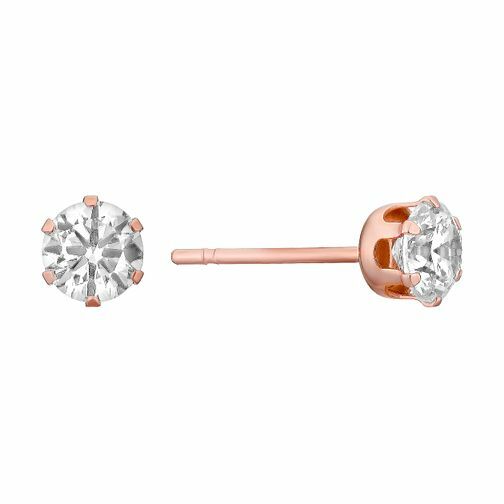 9ct Rose Gold & Cubic Zirconia 4mm Round Stud Earrings is rated 4.3 out of 5 by 6. Rated 1 out of 5 by Anonymous from Lovely earring, for the day I had it The back was too loose so when I put them in I lost them on the first day. I managedto find one earring and one back in the house but the other must have been lost whilst out. Would not buy anything from here again. Basic thing that was done wrong in my opinion. Rated 5 out of 5 by Anonymous from I wear this product everyday now I love these earrings they are now my all time favourite and I will be wearing them everyday until they wear, very pleased.